If you already have existing single glazing in a decent condition adorning your home, then it stands to reason that you won’t want to entirely replace or refurbish your products. With Total Window Repairs, there’s no need to worry about any invasive procedures or excessive improvement projects; we can help you by simply utilising our secondary glazing services. Improve your existing single glazing by adding secondary glazing from Total Window Repairs. Here at Total Window Repairs, we want all of our customers throughout Dorset to experience all of the benefits and features of modern secondary glazing. This doesn’t have to be a difficult project either, as with secondary glazing we simply add a second layer of glass over the existing single pane, resulting in a double glazing equivalent. Wanting to make your property warmer or eliminate external traffic noises? Then secondary glazing is the perfect solution. Any property can benefit from the amazing benefits of double glazing, and we offer our secondary glazing services to both commercial and residential customers. Whether you’re a business looking to update your office block in Dorset, or a local resident looking to make your home warmer or quieter, we’ll be able to help you. We utilise the fantastic Granada range of secondary glazing products, a company who operate as a market-leader in the home improvement industry. These designs mean that you can choose secondary glazing in forms such as horizontal sliders, hinged units, fixed and lift-out units, vertical sliders, balanced vertical sliders and tilt-in balanced vertical sliders. We have many samples available for you to see in our Showroom in Blandford. 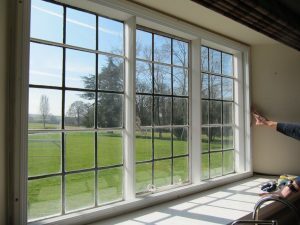 There are a number of features of secondary glazing that make it the perfect choice for any commercial, residential or heritage property looking to benefit from modern double glazing products. Double glazing is well regarded for its thermal efficiency, and secondary glazing provides exactly the same features by emulating the qualities of double. This ultimately reduces your energy consumption, and raises your Window Energy Ratings. 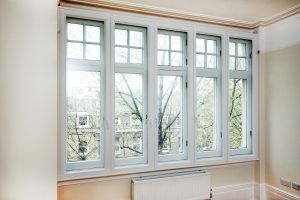 Secondary glazing also functions as an incredibly secure product that is far better equipped to protect your property than regular single paned windows. 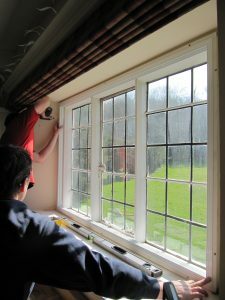 Throughout the installation process, we are careful to use only the most appropriate secondary windows that match the style and design of your existing window. Our secondary panels will line up to your primary window’s mullions and transoms with impressive efficiency, and you’ll be enjoying your new secondary glazing in your property in no time. Our systems are also carefully designed to be discreet, and the fixings are well-hidden. Any finishing trims are explicitly scribed-in and fitted tight, so that the finish is smooth and unobtrusive. The Granada outer frame is then joined to a brilliant hardwood surround which allows for simple and efficient installations by qualified and experienced installation personnel. Finally, your product can be designed to fit your exact design needs and specifications with a host of RAL colours to choose from. Our bespoke colour matching service includes a variety of tones and hues for you to look through, from clear whites to subtle browns. For the more traditional homes, we offer Oak-Wood grains and more, allowing you to craft bespoke secondary glazing. Please don’t hesitate to contact us today to discuss your requirements if you think that secondary glazing might just be the product you need 01258 488500 for more information. Alternatively, you can fill out our online contact form and we will get back to you as soon as possible. We look forward to hearing from you and helping you to find your perfect secondary glazing solution.